Once again Persian homes prepare for the New Year or Nowruz celebrations. 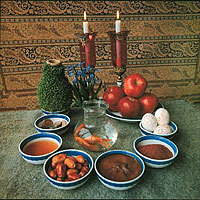 All Persian households follow the practices of this, the oldest of Persian celebrations, which heralds the end of winter and cold and the coming of spring. The house goes through a spring cleaning preparing it for new events in the New Year. Fish bowls containing gold fishes, green wheat or lentil sprouts that have bloomed in decorative plates and shapes, hyacinths and tulips, red apples, mirrors and colored eggs adorn tables on decorative Persian fabrics. In the folds of the Koran fresh money notes are placed to bless them for gift giving. This event signifies the celebration of nature through culture. It heralds re-birth and announces the coming of the new. The dark has passed and the light of hope shines in people's hearts. 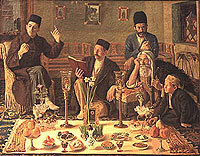 The roots of Nowruz date back to long ago. Historians trace it to pre-Islamic Iran. Some connect it to Jamshid Shah Jam, one of the epic kings of Persia (Iran). The engravings of Persepolis show, according to some historians, signs that the Akkamenid kings celebrated Nowruz some two thousand and five hundred years ago. There is no doubt that this ancient way of celebrating the new year in Iran has endured and adapted through many centuries of history-- surviving the Arab invasions and the conversion of the nation to Islam. 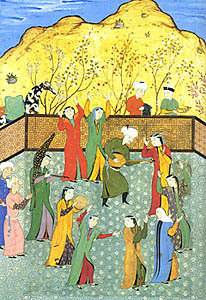 Nowruz Nameh, which many attribute to the poet, Omar Khayyam, adapted this event to the solar calendar and preserved it for future generations. 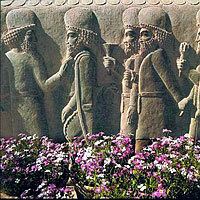 The current practice of Nowruz, is an amalgam of many centuries of cultural influence. The Haft-seen (made up of seven symbols of life and the interaction of human beings with nature), visiting elders, giving gifts, special foods, house cleaning, wearing of new clothes, forgetting old grudges and embracing new things all make up different aspects of Nowruz. This celebration is a sign of the resilience of tradition amongst Persians (Iranians) who, while always looking forward, like to preserve their ancient roots. We at Tavoos Online like to express our best wishes for the New Year and the advent of spring to all Iranians, subscribers and visitors of our site and art lovers the world over. As we say in Persian, Eid-e Haamegee Mobaaraak.